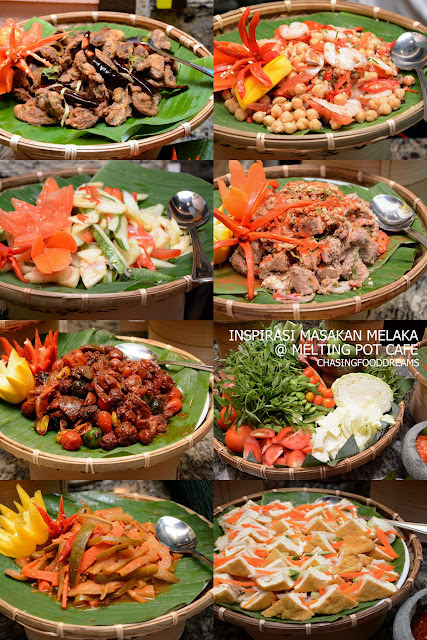 One of my favorite places to Buka Puasa has to be Melting Pot Café at Concorde Hotel Kuala Lumpur. Melting Pot Café is synonymous with their scrumptious spread of buffet for the holy month of Ramadan. 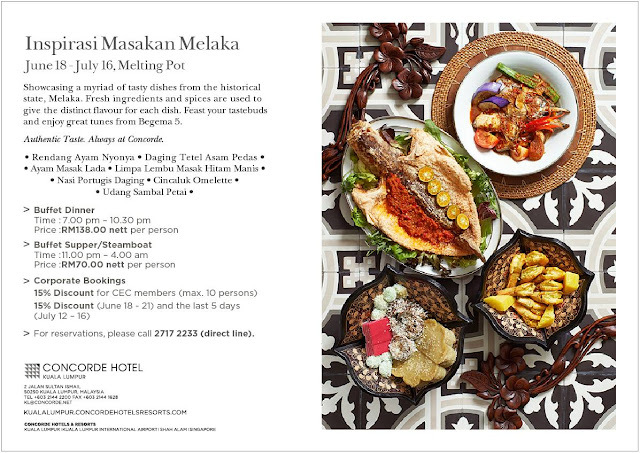 For this year’s buka puasa feast, tuck into a myriad of mouth-watering delicacies from the historic state of Melaka at Melting Pot from June 18 to July 16, 2015. 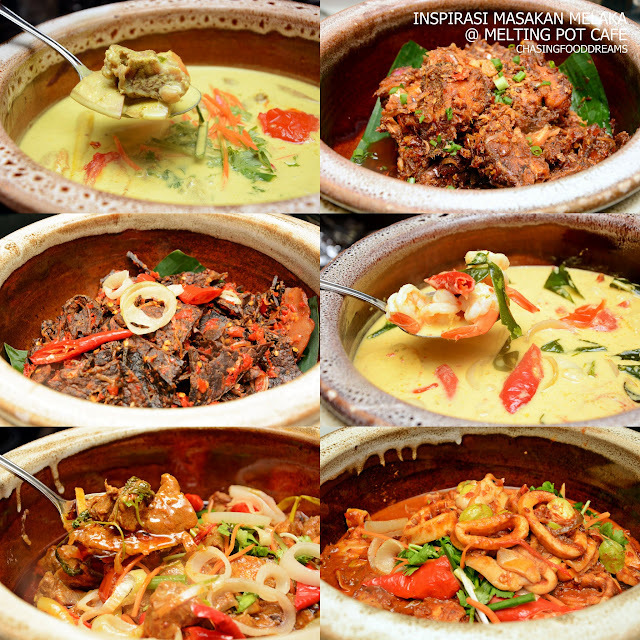 Savor a list of authentic Malay and Nyonya inspired dishes prepared by Chefs Rogayah Sharif and Mohd Ridzuan after a long day of fasting. Enjoy dishes cooked with lots of herbs and spices that will guaranteed robust and moreish flavours to whet the appetite. Main highlights of the Inspirasi Masakan Melaka includes kawahs filled with various Asam Pedas curries like Daging Tetel Asam Pedas, Lamb Chop Asam Pedas, Ikan Merah Asam Pedas, Ekor Lembu Asam Pedas and Ayam Daun Limau Purut Asam Pedas. These are utterly delicious and addictive. 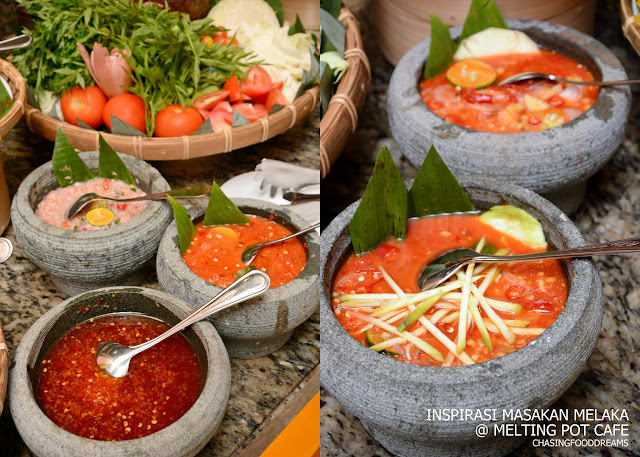 All of the asam pedas have their own unique flavours. The Ekor Lembu Asam Pedas was super delicious with the oxtail cooked till tender and flavourful. The Lamb Chop Asam Pedas was quite different and is very piquant with good balance of sour and savory with umami notes. There is the Ikan Siakap Cili Garam has a moreish and spicy chili sambal that is jazzed up with calamansi lime to accompany the crispy fried fish. Whole Roast Lamb is also a favorite during this month and is available every day for lamb lovers. Savor the nicely spiced rub lamb pieces carved to your order and served with brown or mint sauce. More curries are also available such as Rendang Ayam Nyonya, Kari Kepala Ikan, Udang Lemak Nenas, Paru Goreng Berlada, Sambal Sotong Petai, Daging Lemak Mangga Muda, Ikan Bawal Bersambal and more to go with Nasi Portugis Daging or Briyani Kambing. 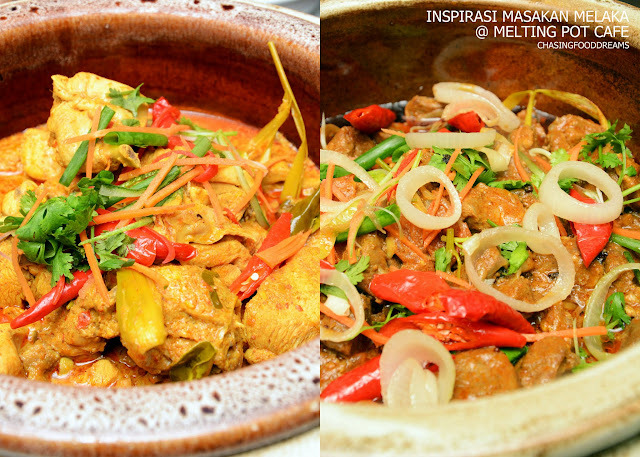 The myriad of curries with its various distinctive flavours are some of the best curries I had, especially the Rendang Ayam Nyonya. Another classic favorite at any buka puasa dinner will be the Sup Gearbox, Sup Daging Singgang and Bubur Lambuk. These are the perfect dishes to start your meal after a long day of fasting. Comforting and soothing, these dishes will warm up your appetite. 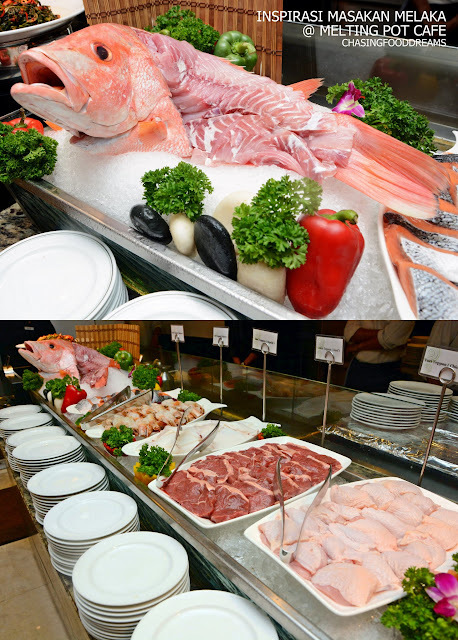 There is also an assortment of Ikan Bakar together with the other seafood at the Teppan Theatre. 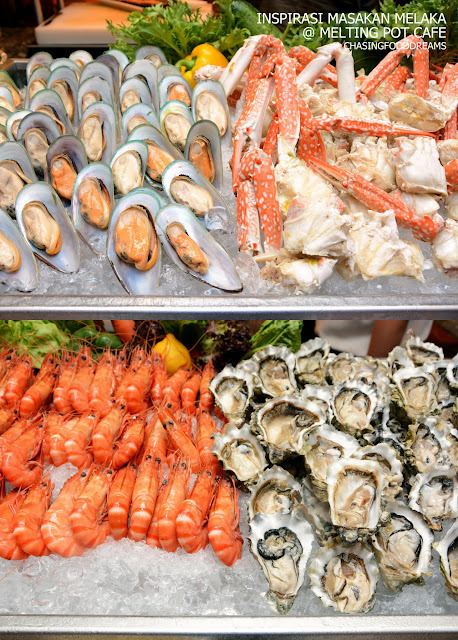 Simply choose prawns, salmon, chicken, beef or squid and the chef will cooked your food to your likings. 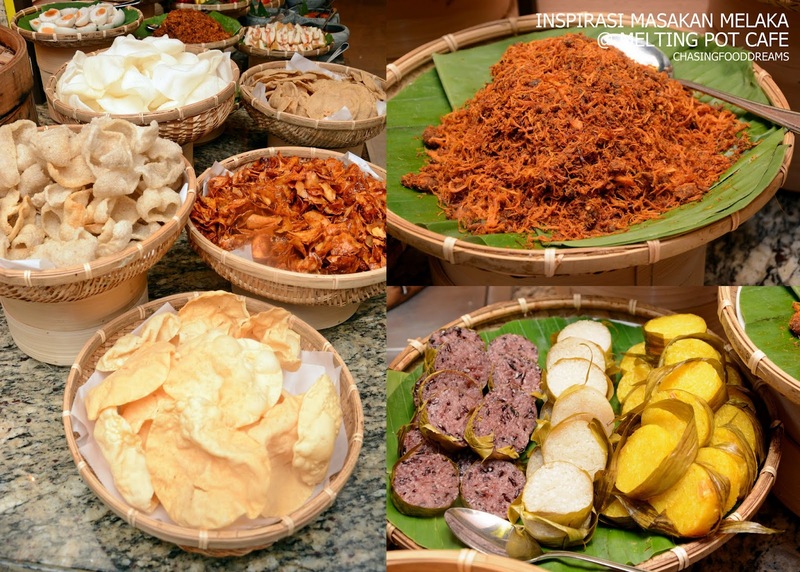 Kerabu station is set with a long and delicious list of authentic Kerabu salads such as Kerabu Udang Tha, Kerabu Mangga, Kerabu Isi Kerang, Kerabu Ayam Berkerisik, Kerabu Pucuk Ubi, Kerabu Udang, Kerabu Hati, Kerabu Limau Bali, Acar Rampai, Ulam Ulam Kampung, Rojak and assortment of sambals. Other condiments to go with the kerabu and curries are Sambals, Telur Masin, Ikan Masin, Telur Ikan Goreng, Jelatah Harian, Kerepek Pisang, Kerepek Ubi Pedas, Keropok Ikan and Spicy Papadam. 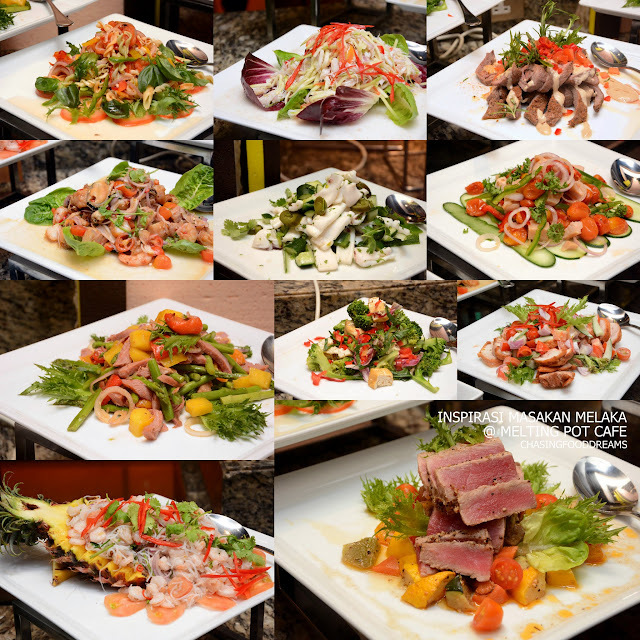 Besides the Kerabu station, there is a cold appetizer and salad station that has Summer Roll, Tandoori Spiced Chicken Galantine, Smoked Duck Breast with Mango and Asparagus, Thai Seafood Salad, Roasted Cherry Tomato and Chicken, Shrimp and Rice Noodle Salad, Crab Salad with Green Mango, Roast Beef and Spinach Salad with Horseradish Cream and more. From the Wok corner, savor Wok-Fried French Beans with Spicy Conpoy Sauce, Sweet and Sour Chicken, Kai Lan with Chili and Salted Fish, Kangkung Belachan and other dishes available on rotation basis. From the Goreng station, there are Samosa, Popiah Goreng, Crispy Vegetable Fritters, Prawn Tempura and more. Besides all the local dishes, there’s also must-haves like the Chilled Seafood bar filled with Fresh Flower Crab, Tiger Prawn, Oysters and Green Shell Mussels. The Noodle station is offering Nyonya Laksa and Mee Udang. The Nyonya Laksa is scrumptious with its creamy curry gravy laden with spices. The dinner buffet ended with a high note as the Dessert Bar is laden with a gorgeous spread of local and international desserts. 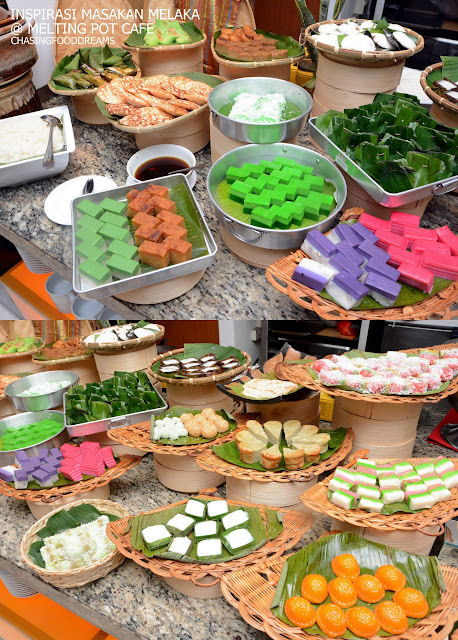 For local desserts, there are assorted Nyonya Kuih Muih, Tapai Ubi, Tapai Pulut, Serawa Durian Pulut, Talam Gula Melaka, Seri Muka, Sago Gula Melaka, Putu Piring and more. Then there’s the sweet dessert broth of Bubur Pulut Hitam, Bubur Jagung and Bubur Kacang Hijiau and Cendol. There is also a live station of freshly made Apam Balik. 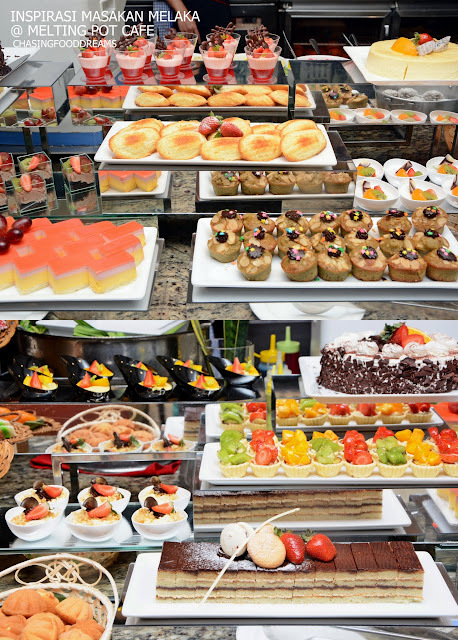 International desserts such as cakes, puddings, mousse, jelly, madeleine, fresh fruits, tarts, ice cream and more. Drinks such as Air Tebu, Air Soya or Air Bandung are also included in the buffet.